Last week I shared with you my first knitting project ever. Knitting is my new passion! Not that I know how to do much more than knit and purl. My husband describes my crafts as seasons. I find something new and go after it like a fully loaded steam engine. But, after a while I lose steam and interest. But until then knitting it is! I love using cotton dish clothes in my kitchen! They are cheaper to maintain then buying new sponges. I have decided to make a set of 12 dish clothes for my kitchen. My plan is to make each of them in different pattern, but all the same color. I have chosen to use Ecru, 100% USA grown cotton by Peaches & Creme. The Ecru is nice since it matches everything and with my upcoming move, I have no idea what color my new kitchen will be. Over time white becomes dingy, cream or Ecru is a great alternative. Are you ready for the first one? Well here it is. 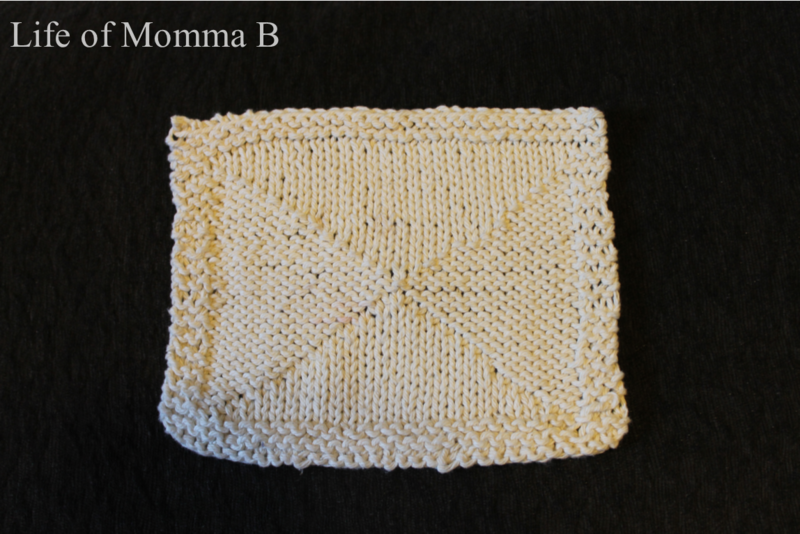 This entry was posted in Knitting and tagged dishcloths, free pattern. Bookmark the permalink. I’m making this today (love the pattern, thanks) and have come to a standstill. There are 33 stitches on rows 1-12, but the “pattern” for rows 13-16 has 35 stitches if you count stitches in the pattern, and then row 17 has 37 stitches. My row 13 ended with 11 knits, not 13, according to the pattern. I have d-checked my knitting, it’s the pattern… I didn’t go any further, but there is just knitting and purling, with no increases/decreases, so there should always be 33 stitches on the needle. Could you please double-check this or advise what the fix is? Oh my! I’m so sorry. Let me see what I can do to fix this. Thank you for letting me know there is a problem.